Several Asian countries, in general, are known as the homes of several temples and shrines. With its long and rich history of Buddhism, various temple and shrines were built that had lasted centuries. One of the many countries that house hundreds of temples would be none other than Japan. Throughout Japan, one can find a piece of its history and culture in local temples. 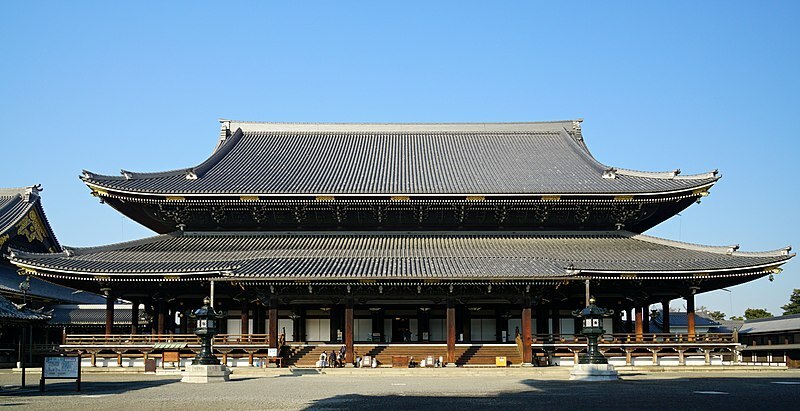 One of the most visited temples in Japan is Higashi Hongan-ji. Also known as the Eastern Temple of the Original Vow, Higashi Hongan-ji serves as part of the two dominant sub-sects of Shin Buddhism in the country. The other half of Higashi Hongan-ji is known as Nishi Honganji. 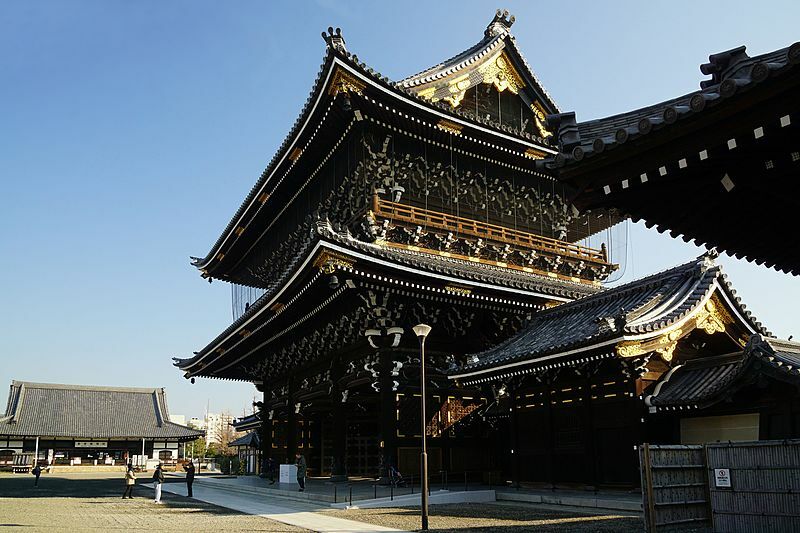 Nishi Honganji is also known as the Western Temple of the Original Vow. As one of the head temples of the Jodo Shinshu sect under Pure Land Buddhism, Higashi Hongan-ji is visited by thousands of followers every year. After all, Pure Land Buddhism is one of the most popular forms of Buddhism in the country. As the names suggest, Higashi Hongan-ji is located to the east while Nishi Honganji is located to the west. To give a brief background of the religion that these temples stand for, a monk by the name of Shinran founded the Pure Land sect of Buddhism. Born in the year 1173, Shinran simplified Buddhism into a single but important teaching, which is to just repeat the words “namu amida butsu.” This sentence translates to, “Praise to Amida Buddha.” The belief is that Amida Buddha made a vow to save the people who repeated this sentence with sincerity. Due to its simplicity in teaching and practice, several ordinary working people at the time took a liking to the belief system of Shinran. This practice grew popular amongst people who did not have the time in the world to adhere to long rituals and practices. Following the passing of Shinran in the year 1263, a Honganji Temple was built for the sole purpose of promoting his teachings. The temple had to move numerous times before eventually getting a land grant in Kyoto. After some time, Tokugawa Ieyasu became the shogun of Japan. In the year 1602, he noticed the growing power of the Jodo-Shinshu sect. Fearing that the sect might eventually overpower him, he made a move to split the sect into two. Ieyasu built another Hongan-ji temple to the east of the original and named it Higashi Hongan-ji. As for the original Hongan-ji, it was renamed to Nishi Honganji. He was able to make the split possible by creating a rift in the Buddhist School. As a result, Higashi Hongan-ji became the rival of Nishi Honganji. After some time, Higashi Hongan-ji was named the Otani branch of the original Honganji temple. Building this temple was also effective in Ieyasu’s plan to diminish the power of the Jodo-Shinshu sect in the early 17thcentury. Sadly, the original temple buildings of Higashi Hongan-ji that were originally constructed in the year 1604 were destroyed by fire for four times. The most recent destruction was in the year 1864, which was a time known for civil and political turmoil. Thankfully, the buildings were reconstructed during the last 19thcentury as well as the early 20thcentury. Constructed 11 years after the establishment of Nishi Honganji, Higashi Hongan-ji contains several halls that visitors can check out today. The main hall of Hiashi is known as the Goeido. Dedicated to the founder of the sect, Shinran, the Goeido is the biggest structure made of wood in Kyoto. Standing next to the Goeido is the Amidado Hall, which was built in dedication to the Amida Buddha. Also known as the Founder’s Hall, the Goeido is known not just in Kyoto but also around the world. 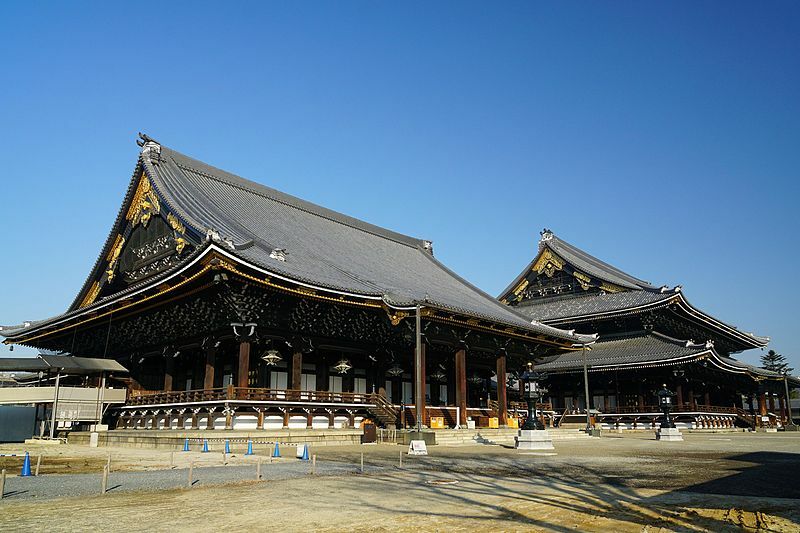 While it is the biggest wooden structure in Kyoto, it is one of the largest on earth. Out of all the structures in the temple compound, the Goeido is considered as the most important building. Rebuilt in the year 1895, the Goeido contains a massive space with a high ceiling. Supported by 90 pillars, the structure houses gold chandeliers, which contribute to its overall shining beauty. Sadly, its inside beauty cannot be captured on film, as photography is prohibited. The area is preserved, quiet, and tranquil. The main altar of the Goeido features a wooden statue portraying Shinran. The walls behind the statue depict a painting of white and red lotuses. The painting was done by a Meiji era artist Kono Bairei, who was also known for his realistic arts of flowers and birds. Framed characters written in gold and read as “kenshin,” which stands for “see truth,” can be found above the altar. It was a subsequent title granted by Emperor Meiji to the founder of the sect. The characters in the hall are a replica of the own calligraphy of the late emperor. Nishi Honganji’s Founder’s Hall also contains a similar calligraphic dedication from the emperor. At 38 meters high, which is approximately equivalent to 125 feet, the hall has a length of 76 meters, which is equivalent to 250 feet. It also has a width of 58 meters, which is approximately equivalent to 190 feet. The hall also has a carved ranma lattice. This lattice is covered in gold leaf and features heavenly figures playing several musical instruments such as lutes, cymbals, and bells. Also known as the Amida Hall, the Amidado was also rebuilt in the year 1895. One can find a statue of Amida Buddha enshrined on the central altar of the hall. A portrait of Prince Shotoku Taishi can also be seen on the right side of the statue. Born in the year 574, the prince played an instrumental role in bringing Buddhism to the country. On the opposite side of the statue hand a portrait of the monk Honen. Born in the year 1133, Honen served as the teacher of Shinran. Last but certainly not the least is the Reception Hall. More commonly known as the Sanpai Setto-sho in Japanese, the Reception Hall can be found on the northern portion of the temple grounds. The hall links to an audio-visual hall as well as to a gallery. The gallery houses regular exhibitions on themes related to Buddhism. Completed in the year 1934, the hall was designed by Goichi Takeda. He also founded the architecture department at Kyoto University. On the other hand, the gallery and audio-visual hall were designed by Shin Takamatsu. Contained inside a futuristic building, it was completed in the year 1998. Aside from the halls of Higashi Hongan-ji, the temple is also known for its gates. One of its well-known gates is the Amida Hall Gate. More commonly known as the Amida-do-mon, this gate is located in the southernmost entry point. The gate was transferred from Fushimi Castle after the castle was dismantled by Tokugawa Ieyasu. Sadly, the original gate was destroyed by fire in the year 1864. Hence, the present gate, which was constructed in the year 1909, is only a replica of the original one. Out of all the gates in Higashi Hongan-ji, probably the grandest one would be the Founder’s Hall Gate. More commonly known as the Goeido-mon in Japanese, this gate was completed in the year 1911. Standing at approximately 28 meters high, which is equivalent to about 92 feet, this gate consists of two stories and contains two roofs. Another gate in Higashi Hongan-ji is the Imperial Messenger’s Gate. This gate is also often referred to as the Chrysanthemum Gate due to the two large imperial chrysanthemum crests engraved on its doors. As the original name suggests, this gate is precisely for the use of imperial messengers. Hence, this gate is usually kept closed. The gate also came from Fushimi Castle. Sadly, it was also destroyed by fire in the year 1864. Thankfully, it was reconstructed and completed in the year 1913. Last but certainly not the least is the Formal Entrance Gate. More commonly known as the Genkan-mon in Japanese, this gate is the northernmost entrance to Higashi Hongan-ji. 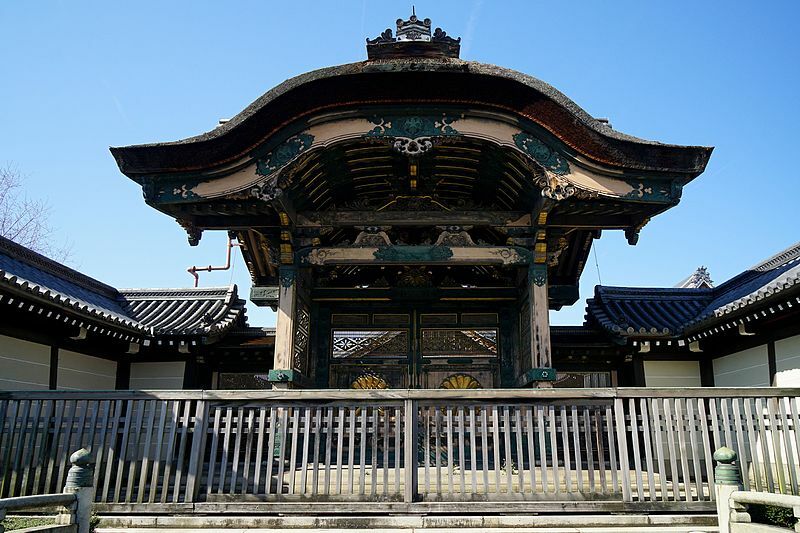 Completed in the year 1911, the Genkan-mon is usually kept closed except for special rituals and ceremonies. Aside from the gates of Higashi Hongan-ji, visitors may also find interest in the exhibits inside the temple grounds. These exhibits can be found on the wooden walkway that serves as the link between the Founder’s Hall and the Amida Hall. The exhibits showcase the great investment of the people that went into the rehabilitation of Higashi Hongan-ji during the late 19th century. One of the interesting exhibits in the area includes a large wooden sled. It was one of many that were once utilized to move lumber from the mountains for the sake of reconstructing the temple. A diorama in the area shows how an avalanche overwhelmed people as they tried to transport lumber for their beloved temple. Many lives were lost and the temple recognizes and commemorates this sacrifice. Probably one of the most famous attractions of Higashi Hongan-ji is the exhibit of ropes made of human hair. During the Meiji period, a problem arose during the reconstruction of the temple. Moving huge wooden beams became an issue because ordinary ropes could not carry the load. Japanese women wanted to help with this problem. They decided to donate their hair so they can build stronger ropes. Several bundles of hair were donated. One can just imagine the sheer number of women who were devoted to the reconstruction of the temple. These ropes are part of the exhibits inside the temple. They can be found enclosed in a glass box for the viewing of visitors. The last feature of the temple is a Japanese garden called Shoseien. It is considered a detached temple residence of Higashi. It can be found to the east of the temple grounds. Shoseien is composed of a pond stroll garden surrounded by several teahouses. Visitors can take a lovely stroll in the garden to enjoy the view. After some time, they can take a rest in one of these teahouses. The garden was donated by Tokugawa Iemutsi. Sadly, several of its buildings were destroyed by fire. Thankfully, the garden was rebuilt in the year 1868. At present, Shoseien is open daily from 9 in the morning to 4 in the afternoon. The garden is best enjoyed during the fall season when the autumn colors depict a vibrant hue and accentuate the beauty of the garden. A temple of the same name of Higashi Hongan-ji can also be found in Los Angeles. It holds several ceremonies and rituals and sustains a number of followers. Every year, Higashi Hongan-ji in LA holds its Obon Festival. This traditional event is held as a way to honor the spirits of one’s ancestors as well as to express gratitude for all the blessings received. It is celebrated to give thanks to the people who provided their offspring with the gift of life. Its Obon Festival features games, food, and several performances such as Bon Odori Dancing. Its last Obon Festival was held on the 29th and 30th of July in the year 2017. For two days, the festival began at 1 in the afternoon and ended at 9 in the evening. Services and performances provided during the event include the Obon Hatsubon service, the Manto-e services, and the Bon Odori performances. There were also tea ceremony demonstrations. Truly, Higashi Hongan-ji is an influential temple, seeing how its influence reached the western portion of the world. It is a temple that people should be able to visit when they are in Kyoto, Japan. It represents not just a part of the history and culture of Japan but also the immense dedication of its devotees. The temple serves as a reminder of how something so great can be built through people’s love and dedication.